Sure, bucket lists are great, but have you heard of shower regrets? It’s like things you want to do, except in the past. But in all seriousness, I try to live a life without regrets. It’s helpful to remind myself that everything I did and learned led me to where I am now, and I quite like myself. But there is NO denying that I could have gotten to where I am just a little bit quicker. 1. I should have insisted on therapy (in addition to medication). This one is important because I circled the problem of my mental illness for nearly 10 years before I hit “rock bottom” and needed someone else to take over. The joke is that I never had to do it alone. The one thing I will let myself off the hook for is that although Canada is really advanced with their health care, it isn’t perfect. There are a ton of incredible programs and services that can take months to be accepted into, and I suppose as a teenager that wasn’t really optimistic enough for me. All in all though, therapy and being taught how to cope and overcome my illness was entirely crucial to my success as an adult. 2. Sometimes you need to remove people from your life. 3. You should find happiness in yourself, and not entirely through relationships. I was so bad with this one. I called myself a Serial Monogamist because if I even had the sense a relationship would end, I’d prepare a backup. I mean, I don’t have a quick fix piece of advice for this one, except that I wish I’d slowed it down, and spent some time finding out who I was and what I wanted. At least then I wouldn’t have wasted so much time with people that were basically awful. The classic line that comes to mind is “There are starving kids in Africa!” Yes, that’s true. But that doesn’t make my depression less valid. That goes for everyone out there. To the kid who got a B instead of an A who is devastated? The pain they have is relative to their experience and it is valid. I let people convince me that I ‘didn’t have it that bad compared to…’ to the point that I was minimizing my own pain and not giving myself the time or healing I needed. 5. Your time is your most important asset. This might have clicked for me about a year ago when I heard that instead of bonuses, our company was giving all of the employees an extra week holiday. This was the first time I realized that an entire extra bonus week was mine, to explore Europe, to go camping, to have a sweet road trip… I didn’t care about the money because I could spend that in 2 seconds and never remember on what. I think that if I put my time first, I would have deemed a LOT of things undeserving of it. Especially accepting being so unhappy for so long. A mental health positive lifestyle blog that deals with everything from depression to DIY. Hello! I’m Kirstie, nice to meet you! I’m a 20-something millennial with a mortgage AND avocado toast - and a history of mental health experiences. I’m here to share those stories + do my part to end the stigma. 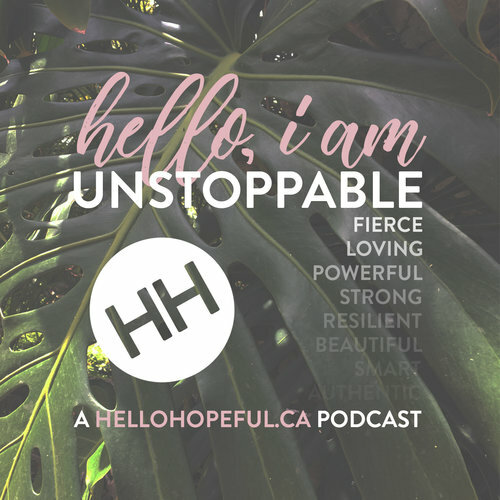 If you're interested in hearing about how Hello Hopeful got started, click here. Hello Hopeful is a for profit blog, and contains ads as well as affiliate links managed by third party networks. Read more here on our disclaimer page.